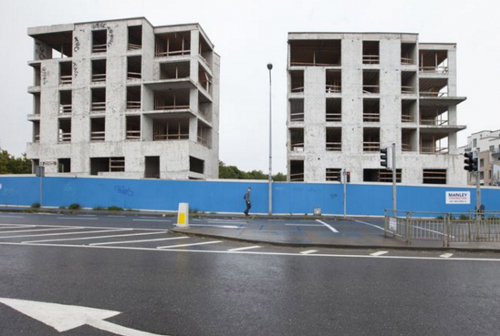 In her fourth of a four-part series on the construction industry in Ireland, journalist Jackie Fox recalled the sub-standard housing developments that were built during the boom, namely Priory Hall and Longboat Quay. In her report, Ms Fox sought to find out if standards are being met today and spoke to Cian O’Callaghan, from the Geography Department at Trinity College Dublin, and Kevin Hollingsworth, chartered building surveyor. Ms Fox said that, over the past three years, Mr Hollingsworth has been involved in the remediation works of 29 developments which she did not name. “One of the main problems during the boom was that there was so much being built, from 2006, there was something like 90,000 housing units built in the country so local authorities didn’t actually have the staff to regulate the standards properly and what was happening then is there was a process of certification that was brought in to play, where developers would hire their own architect, their own surveyor to sign off on the safety standards for the building, the building regulations. This entry was posted in Building Regulations on May 31, 2017 by BRegs Admin. To be precise, when the Building Control Act of 1992 was brought in there was no requirement to seek approval of construction design from anyone, and during the building process there was no requirement to have the construction work inspected by anyone. And there was certainly no requirement to write, sign or produce a Certificate of Compliance. The Act required NONE of these. The only thing the Act required was that buildings had to be designed and constructed in accordance with the Building Regulations. Compliance with that requirement was left up to those doing the designing and building. There was no compulsory independent oversight by anyone. Any time that a building is used as collateral for borrowings the lenders sought comfort that the building used as collateral was in compliance with Planning Permission and Building Regulations. Since Certificates of Compliance didn’t exist the alternative was to get someone with sufficient qualifications and expertise to write a statement acceptable to lenders stating that the building was compliant. Rather than this happening on an ad hoc basis the RIAI standardised these statements by drafting Architect’s Opinions on Compliance. The sale of houses and apartments has always relied on the principle of “caveat emptor” (buyer beware) and this applies to new houses and apartments just as it does to second hand houses and apartments. The truth is the due diligence carried out by lenders and buyers was superficial. There was no independent oversight of designers and builders. In such circumstances it is easy for control to become lax. In my opinion there was nothing actually willful about this increasing laxness, more that it’s part of human nature. Nor in all honesty do I think that non compliance was necessarily from a desire to increase profits – many of these buildings included costly materials, for example cut granite paving in the landscaped areas, stainless steel and glass balustrades, etc. There are numerous examples in many professions, such as banking, the press, etc where self regulation has been no regulation and scandals have arisen. There should really be no argument and no mistake – the ONLY way to ensure proper compliance with the Building Regulations and provide proper consumer protection is through fully funded state controlled independent building control!